A couple months ago I joined a small writer’s group that meets weekly about 30 minutes from my house. It has become the highlight of my week to gather with these people as they tear apart sentences in effort to make it the best it can be. Even though I love it, it is always a fight to get there. There’s lunch to prepare, school work to check, print out copies of what I’m bringing…double spaced…14 pt…pen…I always forget something! And something always calls out to me as I head out the door. This week I thought I was right on time. I got in the car only 5 minutes behind schedule. No big deal. Then, I looked at my gas gauge. Dang! 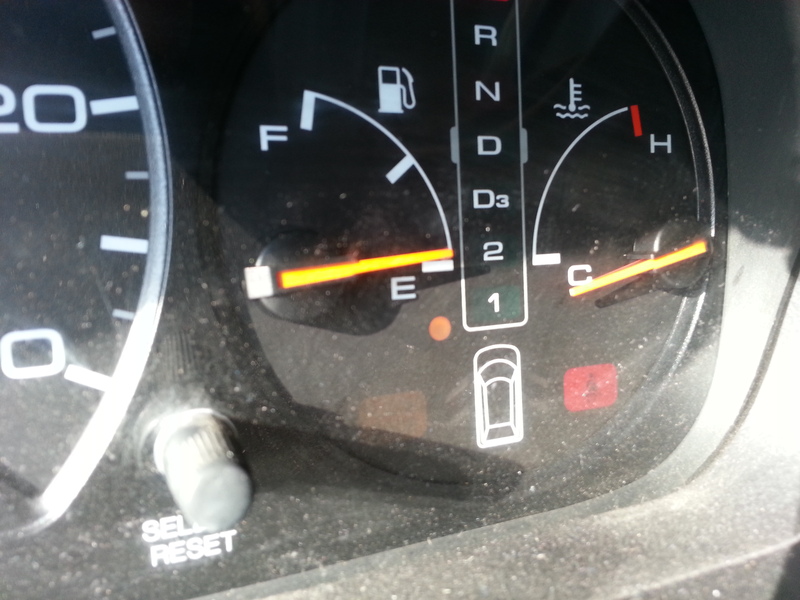 The light was on, though my mileage said I should have at least 60 miles before running empty. I decided to go with my gauge, reasoning it’s faster to fuel up than break down. Driving to the gas station I’m making all kind of ugly faces as I calculate how late I’ll be now. The station isn’t on the way, so it’ll be at least 10 minutes, combined with the 5 I was already behind, so now I’m 15 minutes late. My daughter’s in the car too, for I drop her off at horse lessons on my way there. Soon after leaving the gas station, I found myself behind a truck going 30 MPH in a 50 mile-an-hour zone. By this time, I had to laugh. But inwardly, I was dying. He’s going 30 in a 50, while I actually need to be clocking 70 right now! I thought how perfectly this description fit my life. I need to go 70, I can go 50, but I’m doing 30. I couldn’t pass, couldn’t go another way and riding the guy’s tail wouldn’t make him go any faster. So, I finally gripped the steering wheel, took a deep breath and backed off. I’ve committed to write about Faith for 31 days. I need it. When I’m faced with situations like this, I want to continually dwell on all the things I can’t do, and how far I’m falling behind my schedule. I realize how small my seed of faith really is. I realize how much I rely on my strength to go fast when I need to. I realize how much I like to control things so they go my way. So right now, I’m trying to take a deep breath and enjoy the scenery and the process, even while I’m behind the farmer driving 30. I’m struggling inside and praying for God to clean this mess up that I am. He knew the farmer would be there. He knows what needs to be done. He knows what time I need to be there. Later, I asked the Lord what I need to focus on. Is He asking me to fight to go 70 or even 50 or surrender and don’t look at the speedometer? 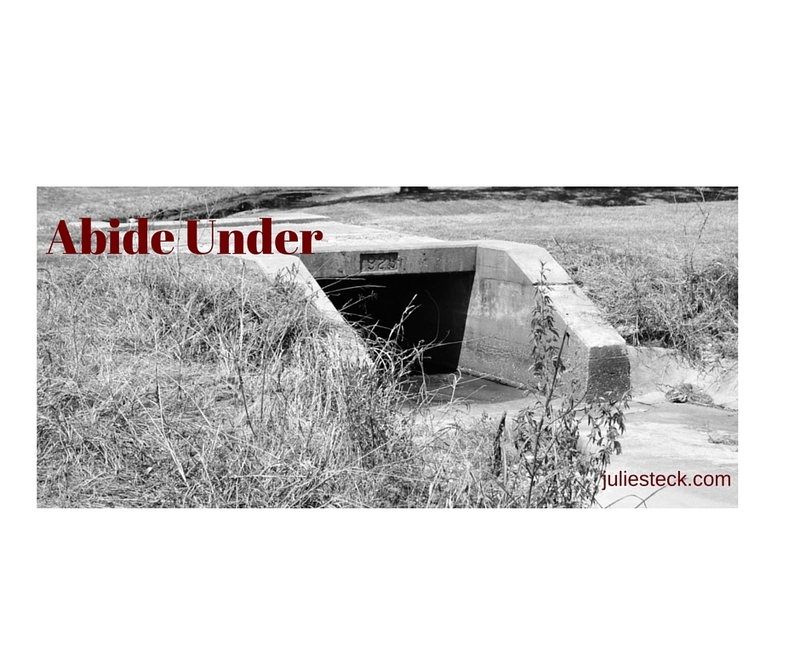 The answer I got… “abide under.” It’s a word translated “patience” many times in scripture. The word picture that comes to mind is hiding under a cement culvert while the hailstorm passes by. You abide under that shelter. I pray today for Faith to wait. Faith to enjoy the process. Faith to abide under the Almighty while He gets me where I need to go in His timing. Thanks for traveling with me today! I hope you’ll check back tomorrow. To view all the posts in this 31 day journey, click HERE. Excited to be on a refining journey along side you. He is doing his thing here too.